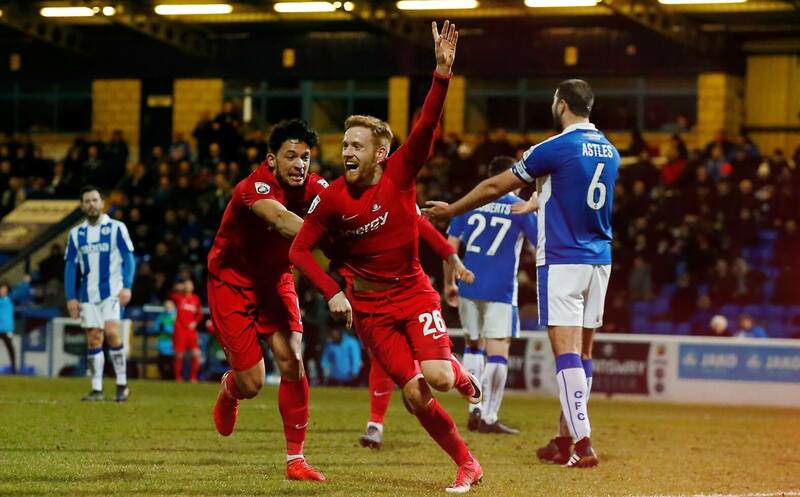 An important win away at Chester City by a goal to nil was more welcome relief for Leyton Orient as they moved up a place to 15th in the National League. O’s fans will be breathing easier as the three points elevate Leyton Orient a more comfortable 8 points away from the danger zone as James Brophy’s second half winner sealed the game. As for the home team it looks bad for Chester as they are now 6 points from safety in the relegation zone. Bottom club Guiseley earned a surprise win at home to Fylde by the only goal as Torquay lost 3-2 at home to Sutton United. Solihull Moors dug out a hard 0-0 draw with play off placed Wrexham at home. Guiseley, Torquay ans Chester are all starting to become cut adrift in the relegation zone while Solihull Moors are at least hanging in there to try and avoid the drop. Following Chester’s home win on Saturday, a 3-1 home success over Eastleigh, hopes were high for the Cheshire team. However the east Londoners had other ideas as a James Brophy header on 67 minutes was all it took to settle the contest in favour of the O’s, and the Blues found themselves out battled in the second half and were unable to pierce a solid Orient defence. Chester started well in the opening exchanges and Ryan Astles saw his 12 yard header from a Gary Roberts free kick comfortably held by Orient Keeper Dean Brill. But the visitors had their first effort moments later when Josh Koroma skipped past Myles Anderson and burst down the right, but his 20 yard effort on the run skewed well wide, much to the relief of Chester keeper Sam Hornby. Leyton Orient spurned a glorious chance with little over 10 minutes on the clock when, with Chester stretched, James Brophy managed to find Koroma at the far post, but the winger saw his close range effort blocked superbly by Myles Anderson. As the first half wore on the O’s were getting plenty of joy down the right hand side through Koroma and Jake Caprice, and looked the more likely to make the breakthrough. Brophy saw a 15 yard effort saved well by Hornby after the winger had broken into the area on 38 minutes before Koroma broke quickly and sprinted down the right to put in a dangerous cross across the six yard box but there was no red shirt in sight to apply a finishing touch. The two teams went into the half time break goalless but both teams showed thoughtful play and determined attitudes. The second half was a more cagey affair with both teams basically cancelling each other out. Astles’ glanced header from a Roberts corner the closest that Chester came to breaking the deadlock. The O’s first chance of the second half came just on the hour mark when Koroma was teed up on the edge of the box, firing low through a crowd of bodies only to see his effort held by Hornby. But the visitors would soon have the advantage when, on 68 minutes, a Caprice cross was whipped in with pace and found the head of Brophy whose glanced header beat Hornby and nestled in the far corner. Chester tried to find a way back into the contest but however they tried they never looked like unlocking a tight Orient backline that never gave the Blues an inch. The home team pushed and unsurprisingly more space opened up at the back as the O’s Koroma broke quickly to cross for Macauley Bonne but the Orient striker could only scoop over from just two yards out when he should have been celebrating the away teams second of the afternoon. A dreadful miss! Bonne almost connected with a Caprice cross shortly after as Orient exploited the space in the final third and the game was getting away from Chester. Roberts tried his luck from 20 yards with five minutes of normal time left but his effort flew well over Brill’s upright. Five minutes of added time were held aloft at the end of 90 minutes but there was to be no saviour for the home side as Orient held out. A crowd of 1,935 saw Leyton Orient shut up shop as the final whistle sounded and a welcome 3 points for the O’s. Now might be the perfect time to have a flutter on the O’s so if you fancy a bet on Leyton Orient then why not checkout the following link.